Margaret_of_York is a Legacy Library. Legacy libraries are the personal libraries of famous readers, entered by LibraryThing members from the Legacy Libraries group. » Margaret of York's catalog. » Margaret of York's legacy profile. Margaret_of_York is also an author. About meI was born May 3, 1446 in Fotheringhay Castle, Northamptonshire, England, the sixth of fourteen children. I am the daughter of Cicely Neville and Richard Plantagenet, 3rd Duke of York. I have two brothers who became Kings of England: Edward IV of England and Richard III. In July, 1468, I wed Charles the Bold, Duke of Burgundy, as his third wife. 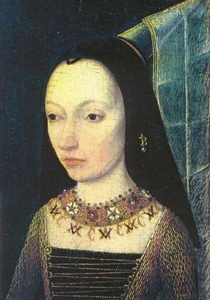 Margaret died on 23 November 1503, at the age of 57. About my libraryMy husband's late father, Duke Phillip the Good of Burgundy, had formed one of the great libraries of Europe, with over 1,000 volumes. My own library is only a few dozen volumes, but many are among the most beautiful volumes known, from some of the best Flemish Burgundian artists. I have been a patron to William Caxton, a translator, and one who becomes a printer in England. The information about my library is based on the proceedings of a symposium organized by the Department of Manuscripts of the J. Paul Getty Museum, in collaboration with the Huntington Library and Art Collection, documented in the book "Margaret of York, Simon Marmion, and the Visions of Tondal", edited by Thomas Kren. Some volumes in the library are composed of several books. Each book has been listed separately, as well as the volume. In this case, all are tagged with the modern manuscript accession number. It thus becomes more clear that there are duplicate books in the library, though they are bound into different volumes.